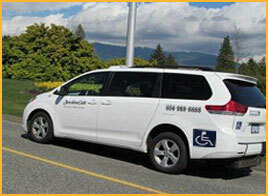 Sunshine Cabs offers Wheelchair Accessible Taxi service for people with special needs to destinations across Metro Vancouver, Lower Mainland, and beyond. We service our clients to/from their homes to medical appointment, rehabilitation centers, employment, theatre, shopping trips, weddings, social activities, or to wherever their heart wishes to take them. As our clients, you can ride with an electric wheelchair, scooters or full size wheel chair with our specially equipped vehicles. Always free feel to call and consult with us if you wish to know more options for your requirements or itinerary needs. Let us help you and those around you plan in advance to ensure a worry-free outing each and every time.